Soul Food for Hungry Adult Communities: March 10, 2013. 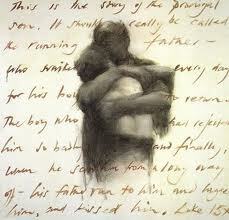 GOSPEL for this Fourth Sunday of Lent, March 10, 2013: Luke 15:1-3, and 11-32: The Parable of the Prodigal Son. A STORY OF A HAPPY MOTHER’S DAY! A PRODIGAL SON, -AND A RESENTFUL BROTHER: – THE MOTHER’S VERSION OF WHAT HAPPENED. Hello, my name is Rachel. I’m bursting to tell you my side of that story. Yesterday, one of my maid-servants and I went to the clothes room, and helped me to take out that beautiful robe that was hanging in the press. It was hand-made, and hand-stitched with beautiful embroidery designs. I wanted to air it for a day or two, and then to press it so it would look its very best. You see, I’m keeping it in the almost-vain hope that my son, my youngest son, would someday come back home to us. My heart is breaking for him, these past years since he left us. Who am I? My name is Rachel. My husband, Abe, and I have two sons,- or at least we had! But one of them left us years ago, when still very young, and took all his belongings with him, and lots of money that my husband gave him- half the value of our property, in fact . And we haven’t heard a word from him, but we know that he is very far away. We have an older son, and he’s a great help around the place. He does everything for his Dad, minds the cattle, tills the land, keeps the place ticking over. He’s just so faithful. The only thing is, he doesn’t like what his brother has done to Abe and me, and he’s angry with his younger brother because of it. But what’s the noise? What’s the shouting? I hear Abe calling out! He’s shouting with delight! What’s going on? By the time I get to the veranda, there’s Abe off down the road, with his robes flying, his beard blowing in the wind; – he’s running,- at his age!!!! And then, I see- there in the distance is somebody walking slowly in our direction, his head bowed. But he looks like our young son. Is it, I wonder? And there’s Abe running towards him,- yes, it must be him! He looks wretched, he looks unkempt, his hair is wild. Now Abe has reached him,- he’s throwing his arms around him, he’s kissing him, he’s hugging him. I’ve never seen the boy’s father so excited in all our married years. They’re chatting animatedly. They stand back and look at each other at arm’s length, and then they laugh, and hug again. Now, they’re coming towards us, the father’s arm around our son’s shoulders, their arms around each other. Abe’s face is beaming, and our son’s face is so shocked by the welcome. Obviously, he wasn’t expecting this kind of homecoming. Next thing, the servants are running towards the two of them. Abe is giving them orders,- take him, bring him in, get him washed, get new clothes for him, get out the BEST ROBE,- oh, my gosh, amn’t I glad that I had taken it out and that I have it pressed and ready and sparkling. He’s calling to me ‘Get out that RING we had kept for him!’ but I’m stuck to the ground. My heart is bursting! I can’t wait, and I too begin to run towards my young son. The tears flow down both our faces, the hugs go on for ever. And then, all three of us, Abe, my son in the middle, and I walk,- we nearly dance!- back towards the house. He’s home! He’s home! We want the world to know. And while my son, my welcome son, is getting washed and cleaned and dressed and robed, with new sandals and the golden ring, I rush off to the kitchen. Abe has already told the servants to bring the wheat-fattened calf and prepare it for a banquet. The musicians are called and told to get ready. The table is made ready, laden with every food we can prepare, with candles to celebrate. And now, the celebration has begun. The lad is beaming,- his face is just radiant! He smells so clean, the sandals shining, the robe beautiful, the ring sparkling. And Abe’s eyes are sparkling too. But where is my older son? Where is the lad’s older brother? I send servants to look for him, and they come back to tell me he is outside in the field, and is sulking,- he refuses to come in. He has heard the music, and has been told his young brother is home. But still he will not budge. He is angry. I nod at Abe, and the father goes out to him. I hear the argument from the kitchen door. ‘THAT SON OF YOURS…’ and the Dad is saying ‘THAT BROTHER OF YOURS…’ The Dad is so happy to have the young lad home, but the older lad just doesn’t want him back. ‘He has disgraced the family, he has let Mom and yourself down… he doesn’t deserve any welcome whatsoever.’ He just keep on referring to him as ‘THAT SON OF YOURS… ‘ I can see that he’s not going to budge! The music goes on, the dancing continues; I am so happy that my young son is home to us. But my heart is heavy because his brother refuses to share our joy. Will he ever forgive him, as Abe and I have done so completely? As I told you, my name is Rachel, and I am still grieving,- because now, one son will not welcome the other. Their Father and I love them both, greatly. Maybe, one day… That’s my prayer. Thanks for listening to my story,- I just had to tell someone. That home-coming was a God-send! I hope my other son’s homecoming, whenever it happens, will be a God-send too! We pray hard for it.